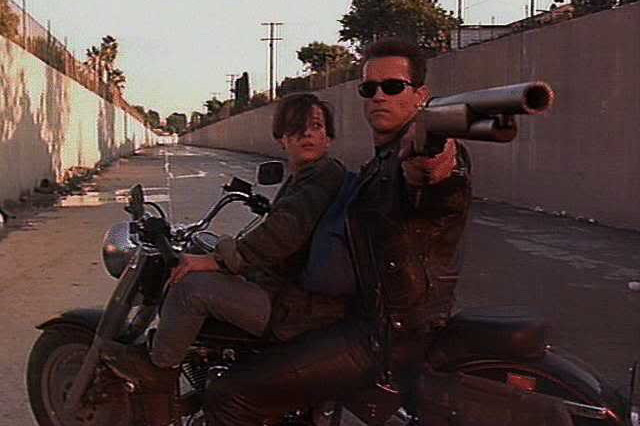 And this week’s (Oct 25-31/13) movie of the week is… Terminator 2: Judgment Day! Happy Halloween everyone. As you celebrate by painting your face or covering it with a mask, perhaps you will remember the movie that was responsible for making 1991 so awesome (along with Seinfeld’s debut, Hurricane Bob, the San Jose Sharks, Nelson Mandela and Mikhail Gorbachev): Terminator 2: Judgment Day. I was in college and my friends told me that though they had already seen it, they wanted to see it again and that I had to see it. I knew this movie was great, even to the point of being what few movies get to be: important. The reason I knew this, and why most people did, was that it lived up to its hype. How many times have you said that you didn’t like a certain movie because all the hoopla surrounding it ruined the experience for you? It happens all the time. Not with this one, though. This one sits high on the IMDb top 250 at #35 beating out Saving Private Ryan, Lawrence of Arabia, and Citizen Kane. To me, the greatest element of this movie comes in the form of a single person, and it’s not Schwarzenegger. It’s the movie’s writer, producer, and director, James Cameron. I do not say this because I am a big time fan of Cameron. I just believe that this is the key ingredient to this movie’s success. It all started in 1977 when he, a truck driver at the time, watched Star Wars in the theatre. After that experience he quit his job to go into the movie-making business. One thing that can be said of Cameron is that he is an innovator. This is the man who gave us not only Terminator, but Titanic, Aliens, and Avatar–all game changing movies. You know the unwritten rule that “the original is always the best”? As in, most sequels aren’t as good as the first movie. This is true of Jaws, Rocky, Back to the Future, and many (most) others. There are, however, exceptions; and Cameron seems to be a master at it. He not only made this sequel, he also wrote Rambo: First Blood Part 2 and (as mentioned earlier) Aliens. Even more impressive is that all three of these movies were released within a year of each other. And to get the results he wants he takes unbelievable risks. This particular movie cost him $100 million. Titanic cost almost $200 million. He is the guy who traveled to the bottom of the Mariana Trench to explore it, just because no one had ever done it and he, therefore, wanted to. In 2007, Entertainment Weekly ranked him #3 in the list of the 50 smartest people in Hollywood. Currently the highest grossing movie of all time is one of his, Avatar, and it has brought in over $2.7 trillion. The second highest you ask? That’s his too. Titanic has raked in $2.1 trillion worldwide. And if none of the above impresses you, consider that all but one of his films has been either nominated for or won the Academy Award for best visual effects. Congratulations Terminator 2: Judgment Day, this is your week. Best actor: Johnny Depp. I’m going with my brother on this one. As good as Arnie was, I do believe Johnny was better as Captain Jack “Keith Richards” Sparrow. Best actress: Linda Hamilton. Her reaction to seeing the Terminator when she was escaping the loony bin was enough to get this vote. And in case any of you were wondering what the #3 highest grossing film was, it is The Avengers, which almost won movie of the week. How awesome would it be to have a sequel with Hulk taking on the Terminator! And this week’s (Oct 18-24/13) movie of the week is… The Shining! It’s Halloween soon and the picks this week were all freaky in their own ways. I saw The Shining for the first time this year and was anxious to see what the fuss was about. Some things I had known because of all the references and parodies I have seen over the years. One of my personal favourites is Weird Al paying tribute by copying little boy Danny in UHF. “Red rum!” Though I didn’t find the movie the scariest I’ve seen (I’ll share which ones those are later…), but it was pretty freaking creepy. The Shining, a Stephen King novel, is a real wonder to watch. The story is strange and twisted, but it’s also irresistible. It is one of those movies that was a bit ahead of its time, which is typical for its writer/director Stanley Kubrick. This is evident when we look at how acceptance of the film has evolved. It actually had a pretty weak box office run. Reviews weren’t stellar either. Now, however, it’s considered a classic and enjoys a fairly strong spotlight in pop culture. The amazing thing about it is that it is still considered very scary. I think that one of the hardest things for directors and producers to do would be making a comedy stay funny and making a horror movie stay scary over time. Mr. Kubrick, you outdid yourself with this one. So, for making generations of moviegoers’ neck hairs stand on end, Kubrick gets the nod. 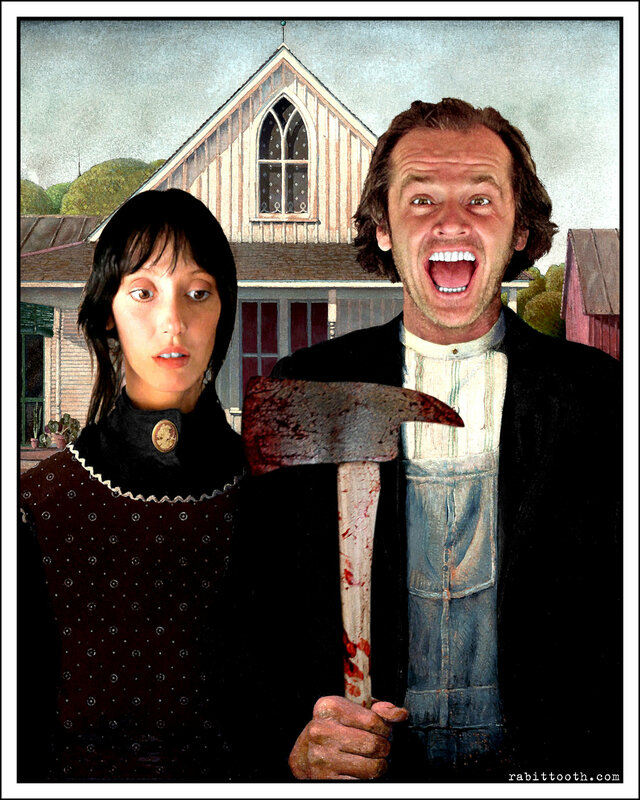 Congratulations The Shining. This is your week. I remember watching The Silence of the Lambs in a living room crammed with fellow students when I was attending college. This was my first memory of even knowing who Anthony Hopkins was. There were scenes that disturbed me, but I–and the rest of us–were pretty ok with that. A great movie makes you feel something, and in this case Silence of the Lambs gets its audience to feel shock, confusion, pity, disgust, and most of all, fear. I find this to be the type of movie you watch and continually say to the person sitting next to you, “Can you imagine…?” Pretty amazing too that this movie beats out The Shining on the top 250 by 26 spots. It’s also one of only 3 movies that has won all of the top 5 Oscars: best picture, best actress, best actor, best screenplay, best director. The other 2 are It Happened One Night and One Flew Over the Cuckoo’s Nest (coincidentally a Jack Nicholson movie). Now for The Exorcist.,, Oh boy… I’ve never seen it because I’m too chicken. Just seeing scenes of it freaks me out! The fact that this movie has this kind of affect on people probably means it should win, but we’re looking for movie of the week, not necessarily scariest movie. I like a good horror movie, but as someone who loves to get wrapped up into a story, scary movies can really work on me. Personally, I find the scariest movies are Paranormal Activity and The Blair Witch Project. I’ve shared that with people who have said to me about either one, “Scary? I thought it was stupid.” Maybe they were, but try explaining that to the hack job my incisors have done to my finger nails and the different colour shades of my pants when I watch them. If you really place yourself in the story you can have yourself a good scare. I’ve heard the same thing can be said of The Ring and Insidious, but I haven’t seen those. Yet. So Exorcist, you’ve scared everyone on a completely different level, and that deserves a very timid high five. Best actor: As truly great as Jack is, I think Anthony Hopkins deserves this one. Best actress: Not to copy the Academy here, but sticking with Silence, Jodi Foster is a shoo in for this weekly nod. Best quote: It’s amazing to me that even though “Here’s Johnny!” is such a classic quote (and Josh, if you’re reading this, I loved your vote of “Danny’s not here Mrs. Torrance”… I almost picked that one. ), by far the most quoted is this week’s quote of the week: “I ate his liver with a side of fava beans and a nice chianti.” followed by the menacing slurp/suction/beat box hybrid sound. As I type this I have to leave and go to work. All play and no work make’s me a dull Troy. 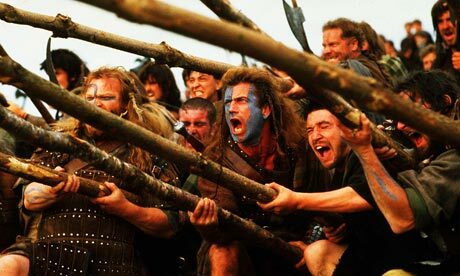 And this week’s (Oct 11-17, 2013) movie of the week is… Braveheart! I almost got myself into a lot of trouble with this movie. I was a new youth pastor in Greeley, CO. One of the teen boys was talking with me about movies and he mentioned that he really wants to see Braveheart. I gave the same reaction I have given over and over again throughout my life, and every time I do I mean it. I said, “Ohhhhhh, I reeeaaallly want to see that!” He said, “We should go see it sometime,” to which I heartily agreed. But I forgot one thing. It was (and is) rated R for violence. His mom talked to me and asked if I’d made plans to take her son to see Braveheart. Luck for me she was a very understanding mom who sensed that I’d gotten ahead of myself in trying to relate to her son. Let’s not forget the deep rooted desire of all youth pastors: to be cool in the eyes of teenagers. That desire makes you say and do things without thinking. I did see the movie, but not with any minors. I watched it with a good friend and I instantly wanted to own it. Like everyone, I loved the battle speech, the surprise defence strategy that is revealed (just after William Wallace is shouting, “Hold! HOLD! HOOOLLLD! !”), and the cry out for freedom. But I have a confession to make. By far my favourite scene is quite a violent one. No, it’s not the inspiring speech. My favourite part involves a flail to the head. It comes after Wallace realizes… oh wait. Spoiler alert. This is something that happens relatively early in the film, but in case you haven’t seen this movie and don’t want to know details yet, just skip to the next paragraph. Ok, back to the favourite scene. So, Wallace gets news that his woman has been killed and he is mad. He’s not angry. He’s not even furious. He is MAD. He is spitting nails, breathing fire and has reached the maximum level of pissivity. He’s so mad he’s like Bjork just became a sith lord and walked into an airport full of Jedi reporters. He acts like he’s about to surrender, riding slowly towards the enemy with his hands on his head. But at the last moment, he grabs a flail and swings it down hard on a guy’s skull. Yes, I am sick. But sweet hosanna that was awesome! Braveheart is like Rocky. It stirs the warrior inside of you that wants to jump out and fight for something, someone, or yourself. It’s inspiring. Of course, Mel has really done himself in since 1995. But this movie is so incredible it will make you forget about his insanity just long enough to take in a truly epic story about a truly epic man. Congratulations Braveheart. It’s your week. I have to confess something else. I was hoping for Pulp Fiction to win. When I first watched it, I was disturbed. There were scenes that bothered me for days. But I couldn’t get passed the fact that this movie was so well made. The acting is excellent, the scenes are heart-pounding and gripping. The characters are wonderfully complex and the scenes are as memorable as any in the movies. Well, PF, we’ll try harder next time. The Truman Show is one of those movies that you can bring up in a crowd and you are guaranteed to have at least one person express how this is one of their favourites. I’m not sure why I say this, but I think this is one of the most respected movies by both critics and movie goers alike. The story is highly original and Jim Carrey’s performance is outstanding. And let’s not forget that this was yet another Oscar snub for Carrey who should have a shelf full of Oscars. Best actor: Tie: Jim Carrey, though both Samuel L. Jackson and John Travolta are so good we should at least give them a best supporting actor here. Best actress: Uma Thurman. No contest there.